On Tuesday the train system here in the Netherlands, run by a company called Nederlandse Spoorwegen or more commonly NS for short, went to hell. Well, maybe not literally, but I am sure a lot passengers thought it was! The craziness actually started around 17:45, when a 21-year-old shoplifter stole something from Albert Heijn at Schiphol airport and fled down the escalators to the train platform. As he noticed he was being chased – by the military police, due to shoplifting at a national airport! – he decided to jump into one of the train tunnels to get away. He was found and arrested anyway. But think about it – what happens when someone runs onto the tracks? The trains are immediately stopped, of course. Anything in the general vicinity. That was the begin of the chaos – Schiphol is an important hub for both travelers entering and leaving the country. But no, it gets even worse. About an hour later, NS tweets there is a major issue with the railroad switches (which determine what direction a train should go in, this platform or that platform; this direction or that direction) in and around Amsterdam. Because of this, no trains can enter or leave the city. 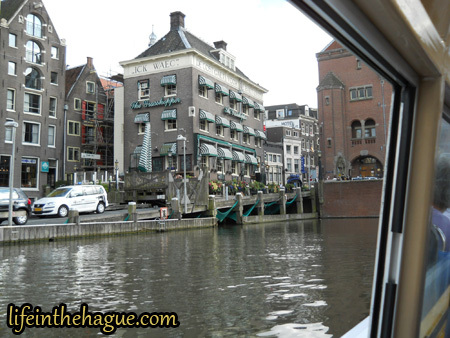 Amsterdam isn’t that far from Schiphol airport – about 15 minutes by train, give or take. Coincidence? Hmmm. Around 20:00, NS reports that the situation has been fixed and they are bringing the system back online. Around 20:30, this proves not to be the case, with the train system around Amsterdam still down. By 22:00, NS has about 70,000 stranded passengers on its hands and is forced to shut down a train station at Amsterdam-zuid (Amsterdam south) because of overcrowding on the platform. Passengers begin referencing a seldom used hashtag, #treinpoolen (car pools for train passengers) to try and get car pools organized for people to get in and out of the city. NS even references it in a tweet. It’s too complicated to bring in buses to get people home, since it is too overcrowded and most of the buses are in use elsewhere in the country for other ongoing construction projects. The NS does however promise to get the remaining passengers home that night, with roughly one train running every hour (manually) in each of the directions from Amsterdam. Around about 03:30 that night, the system is fully cleaned and restarted. The only hinderance left is that some trains might be shorter than normal Wednesday morning, since they aren’t in the right starting place anymore. The NS promises to look into the situation. Later on Wednesday the report is released with the cause of the railway chaos (article in Dutch). It turns out that the thief running into the train tunnels and the major issue with railroad switches around Amsterdam are connected. Cause and effect. When the trains around Schiphol were forced to stop and remain in their current position, one of the trains found itself in a very unlucky place. It was sitting right above the area where the software determines whether a train goes this way or that way. The software thought that a train was repeatedly arriving, and so it repeatedly passed information about which platform to go to. Just over 32,000 times, or 32,768 in exact terms. With 16-bit software, this causes an integer overflow. At the same time, a worker tried to add a platform number by hand for this train. The two events together caused a minor meltdown. Here’s the official article about the cause (still in Dutch). The crash caused some corruption in the data. Around 20:00, the corrupt data seemed to be removed, but when the system was re-started this was not the case. By 03:30 that night, the system had been fully cleaned and brought back online, just in time for the morning rush hour. “Doughnuts. Is there anything they can’t do?” — Homer Simpson (from “Marge vs. the Monorail“, season 4, episode 12). So much of my childhood was based around the Simpsons! Here are a few more photos from Marco and I’s trip to Amsterdam a few weeks back – this time from the local Dunkin’ Donuts on Damstraat. Dunkin’ Donuts opened stores in the Netherlands at the beginning of this year. So far they have 5 locations across Amsterdam with plans to move into other cities by the end of the year, including nearby Zoetermeer. And of course Dunkin’ Donuts is looking to open a location in The Hague in 2018 (article in Dutch). It isn’t without controversy – Dutch political party PvdA was against Dunkin’ Donuts coming here due to the food being unhealthy (article also in Dutch). PvdA is Partij voor de Arbeid, or Labour party. Understandable, but I do not believe fast food should be banned purely for health reasons. and a stroopwafel inspired donut, with a piece of stroopwafel cookie on top and caramel filling. Sounds heavy! Our six choices are above. Top row, left to right: apple crumble, toasted coconut and Dutch blue (Delft blauw pattern). Bottom row, left to right: chocolate rainbow, maple drizzle, and lemon. I don’t like donuts with filling (I know – sacrilegious! ), so the two donuts for me were the chocolate rainbow and the lemon donut. 🙂 Yum! Even though it is only January, sometimes it can feel like spring. Especially in Amsterdam! Yesterday was National Tulip Day, the third Saturday in January. It’s the official begin to the tulip selling season, and to celebrate this the tulip growers bring 200,000 tulips in crates to the Dam Square in Amsterdam. Once everything is set up around 1pm, anyone can enter and get pluck a bouquet of tulips for free. Expect to stand in line for a few hours, though! After about 3 to 4 hours, all tulips have been plucked. First, a link in English, with a stunning time-lapse video from 2015, including the setup. And a link in Dutch, with photos of 2017 Nationale Tulpendag, including photos from above which show the overall design. I find it a nice touch that the design for 2015 is different than 2017. Now look at the picture again, but this time focus on the top of the guitar. That is a bit unnerving! I’ve always loved taking photos of spiral staircases. Pretty! 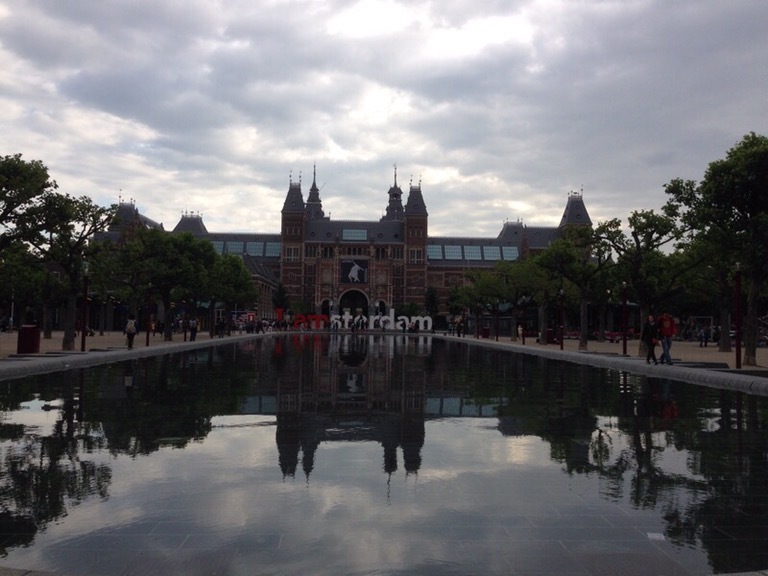 Note the “I am Amsterdam” art installation (climbable at your own risk!). Besides the Rijksmuseum we also visited the American Book Center, an English language bookstore, and Eichholtz Delicatessen, a great store for American (and international) candy and snacks. 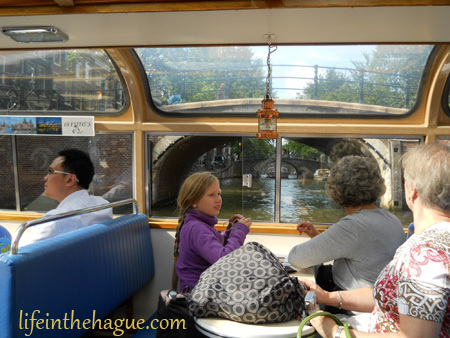 Here are some more pictures from the canal boat ride we took back in the summer of 2010 (“we” being Roger, Marco, Marco’s Mom and I). 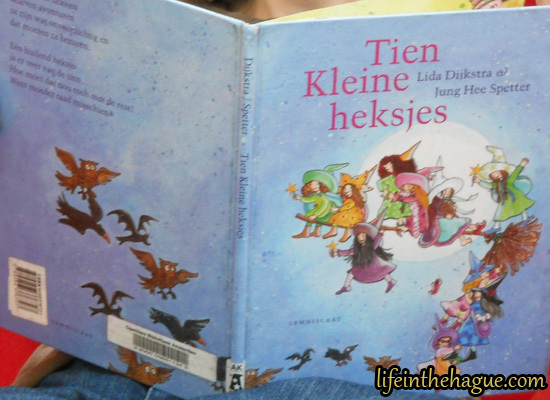 Before there were chapter books like Het geheim van de verliefde hulpkok, there were picture books like Tien kleine heksjes (10 little witches). Marco and I had gone to Amsterdam Public Library, and we stopped at the children’s section for this photo. You can see more pictures of the children’s section of the library by looking at one of the first posts I wrote for this blog. 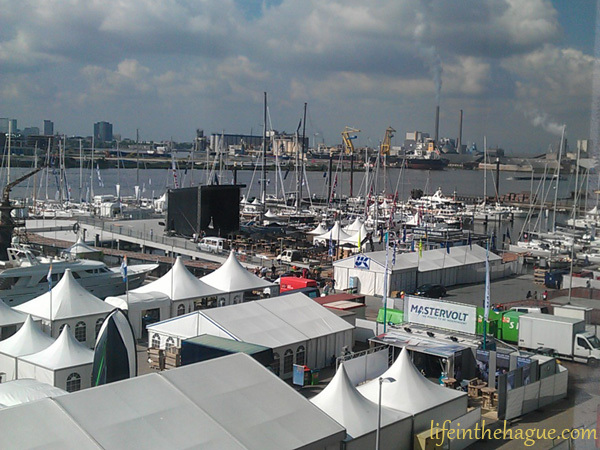 Roger was gracious enough to send me some pictures of Amsterdam’s in-water boat show which starts today, September 4, and runs through Sunday, September 9. He has been watching the construction of the marina over the past few months, which will house all of the boats this week. 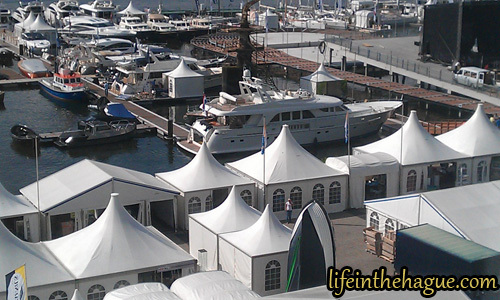 Apparently most of the marina will stay after the boat show wraps up, which is nice. You can also see a list of activities broken down by day — though it seems like a lot of activities happen on all of the days. 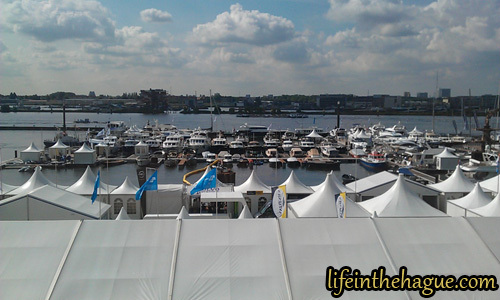 There will be 200 exhibitors and 300 boats. You can read more about the facts & figures of this event by going to the press section of their website.